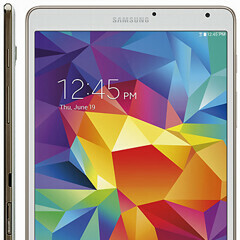 Samsung's Galaxy Tab S AMOLED slates to be launched in late June? Have you heard? Samsung is getting ready to announce new tablets on June 12, during a Galaxy Premiere 2014 press event. We’re expecting to see the Galaxy Tab S 10.5 and Galaxy Tab S 8.4 being officially unveiled that day. But when will these tablets be available to buy? Well, according to a leaked timetable that seemingly comes from an unnamed US retailer, the new family of Android KitKat slates should be launched on June 27, with pre-orders starting June 13 (free cases included). Not long ago, press renders of both the Galaxy Tab S 10.5 and Galaxy Tab S 8.4 showed up online (see here and here), so we already know a lot about the two tablets. Sporting design elements reminiscent of the Galaxy S5 smartphone, the Tab S 10.5 and Tab S 8.4 reportedly offer AMOLED displays with 1,600 x 2,560 pixels. Other common features should include 3GB of RAM, Samsung’s own octa-core Exynos 5420 processor, and fingerprint sensors. Earlier this week, it was revealed that the Galaxy Tab 8.4 is only 6.5mm-thin - which likely means that the larger Tab 10.5 is also a very thin slate. Both new tablets will probably cost a bit more than the devices included in Samsung's Galaxy Tab Pro line. But we assume that some customers will pay extra to have an AMOLED screen on their tablet. Or maybe not? We'll see. Is this Tab S going to replace Tab Pro? So the only difference between the tab s and the tab pro series is only the Amoled display? thats a huge difference at least for me I was just waiting for tablets with AMOLED displays. Wait I just bought my wife a tab pro 10.1, it is using Exynos. I don't remember seeing anywhere that Tab Pro is Qualcomm. Oops my bad. I bought my wife a note 10.1 actually not tab pro. No wonder I got exynos.